When it’s nice out, we need to take as much advantage of the weather as possible. Before Fall hits, we should soak up the suns rays, and the best way to do that is by doing something fun outside! There are a million and one different yard games you can play, or you can go for an all-out sport such as basketball, volleyball, soccer, or football. If you want to play a game that will make you work up a sweat, but doesn’t require you to run yourself crazy, then why not get something that has the best of both worlds? Spikeball is like a cross between volleyball and foursquare. This only takes up a little more space than a game of foursquare would, and requires the setting and spiking skills of volleyball for you to come out victorious. It requires far less running on your part, but makes you pay a bit more attention, as the ball is much smaller than a volleyball or dodgeball. 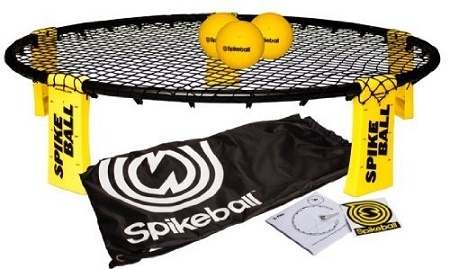 This set comes with the Spikeball net, which sits at about ankle level, three balls, a carrying bag, and a set of rules. This is going to cost you $59.99 and looks like it could be a fun game to play for kids and adults alike. The best part about this game is that you don’t have to worry about setting up a net or finding a free court to play on. While it is supposed to be 2 on 2, there’s nothing wrong with bending the rules to add in more than four people or more than one ball.